These are the twin cubs of Tuff Luck and Wolfgang. 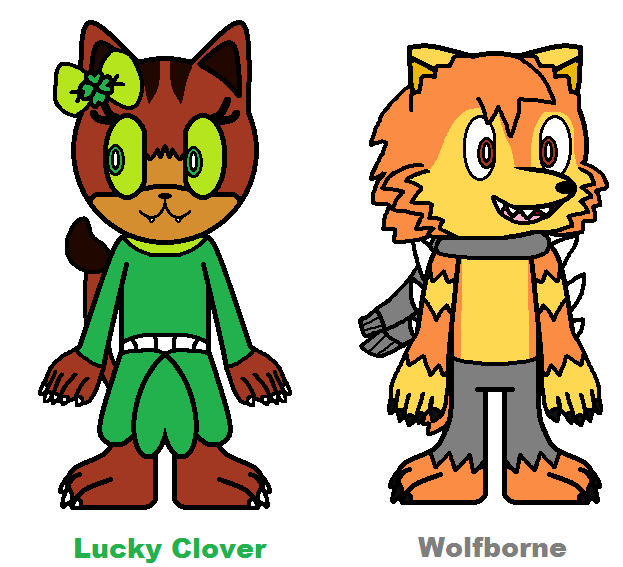 Lucky Clover: *Simply just Clover* A youngest twin who inherited her mother's element and luck. She is a friendly and peaceful type of person that dislikes her father's evil music, but loves him anyways. She is also obedient towards her mother and is very well mannered, unlike her older twin brother that is. Wolfborne: A eldest twin who inherited his father's element and evilness. Unlike his father, who wasn't always a werewolf but born a human, he was born a werewolf, due to the fact that Wolfgang is currently a werewolf. He is a rowdy wild child and acts like a wild and feral animal that likes any kind of meat, while the raw and fresh ones are his favorite. His mother always tells him to not misbehave and get in big trouble at the same time, but he does it anyways. Wolfborne also loves his dad's music, and he even let his son play with his bone harp one time. He also tends to act like a little puppy.